Sometimes I am amazed how quickly some extraordinary meals can come together. 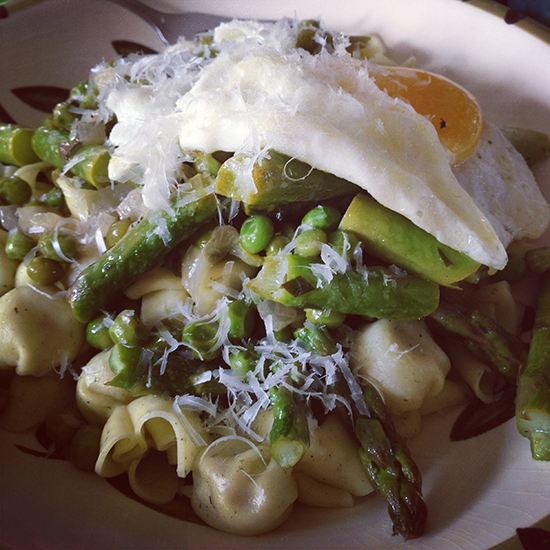 This Springtime Veggie Pasta is an easy weekday dish but looks and tastes restaurant worthy. Of course, as the name suggests it’s the perfect time of year for the ingredients – fresh asparagus, peas, and tarragon. I used proscuitto pasta instead of the recommended spaghetti and it added a nice saltiness. I imagine other ingredients could be changed easily to suit your taste. It’s recipes like this that get me excited about trying to cook more with limited time on my hands. When you’ve been under the weather for seemingly forever as I have, you crave comforting food that’s simple and easy to make. This Pasta with Tomato Cream Sauce recipe from The Pioneer Woman fit the bill in every way without being the least bit boring (all that cream and parmesan helps). It’s great as is, but also a good based for experimenting. We made ours to the letter except substituting bucatini (my favorite pasta) for the fettuccine. I was in search of a nice, easy sauce to accompany some sweet pea raviolis from the Ravioli Store (via Fresh Direct). I came across this great Scallion Cream Sauce at Big Girls Small Kitchen and knew, as a scallion fan, it would be perfect. The recipe also includes quick homemade raviolis if you’re more ambitious than me. Fresh tasting and simple, this was perfect for an impromptu dinner get together. Just pair with some wine, meats and cheeses. I am usually slave to a recipe, so I was very proud of myself for producing such a great meal tonight without one. I owe a lot, of course to the awesome ingredients I picked up from Eataly (a madhouse on the weekend, phew!). I opted for a thin lamb sausage that proved to be delicious and a jar of Sugo al Pomodoro e Verdure Dell’Otro (tomato and vegetable sauce). 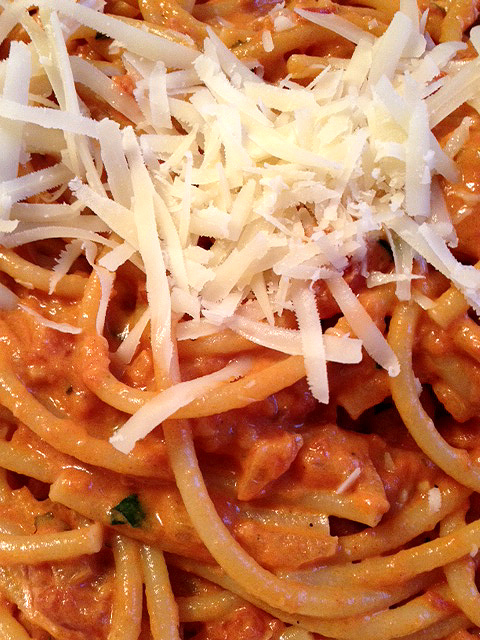 I had my favorite dry pasta waiting at home – Rao’s and went to work. I started with tons of garlic slices (at least 5 cloves), olive oil and the sausage and let it cook while the water boiled. Once the sausage was browned and the pasta was cooking (9 and a half minutes makes perfect al dente) I added the jar of tomato sauce, parmesan rind, garlic salt and cracked pepper. Lastly, with just a few minutes left on the pasta, I threw in three handfuls of arugula which wilted quickly as well as a splash of lemon juice. 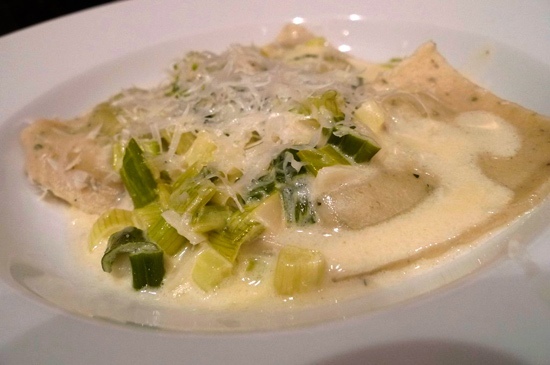 Just add the pasta to the mixture once it’s done and top with a heap of parmesan – mmmm! I deserved (and got) a Sixpoint Sweet Action for such a yummy meal. 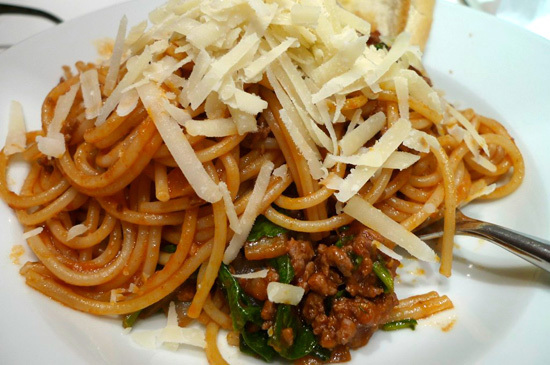 This Lamb and Spinach Spaghetti recipe won rave reviews and even though I made a ton, not a strand of pasta was left. 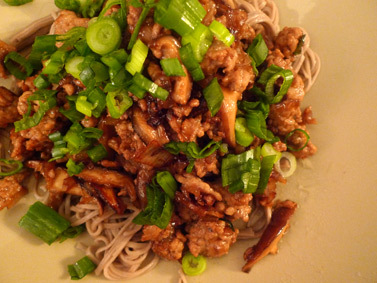 Lamb lends an earthy taste and makes for a much less greasy meal than if this called for ground beef. 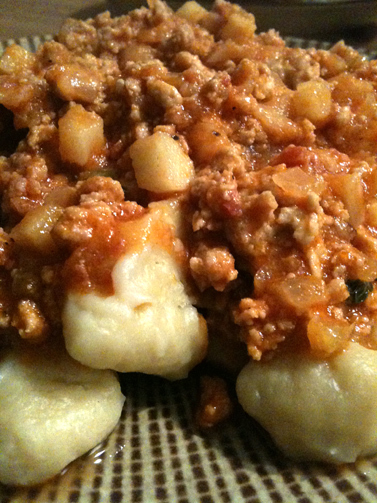 Sunny days are not quite here yet, so take advantage of heavy comfort food weather and make this delicious dish. 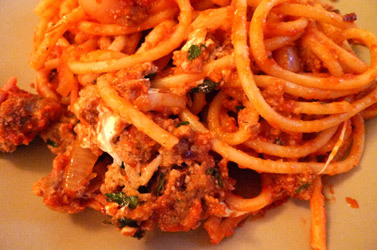 This Spaghetti with Crab Sauce may not be too much to look at and the limited recipe list may indicate a lack of flavor, but it will surprise you. 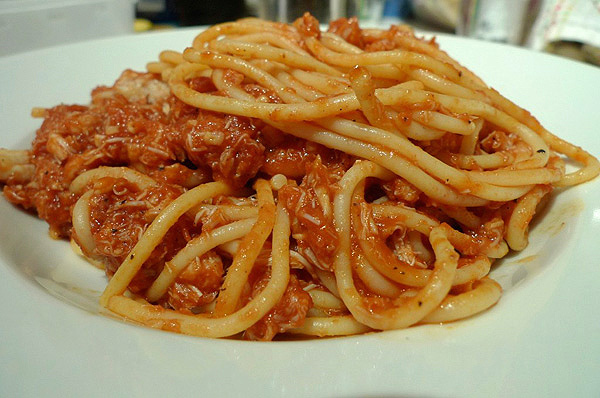 Hearty and delicious, this simple meal focuses on the crab, which I have never tried in a tomato based sauce before. 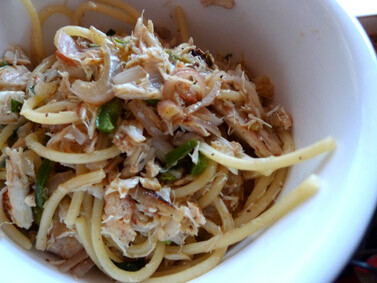 Mario Batali calls for fresh Dungeness Crab, but, come on – it is still yummy with the canned stuff. 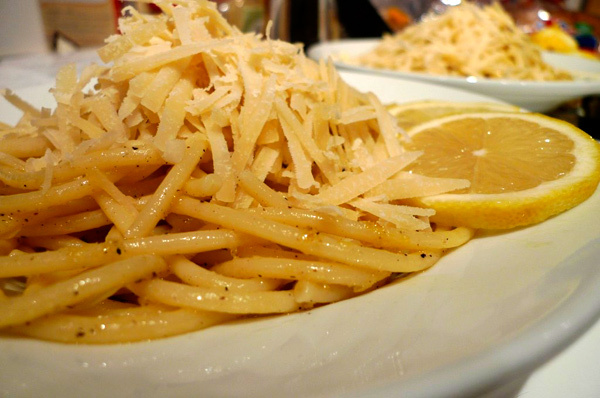 This Bucatini a Limone recipe is simplicity in a dish. From Mario Batali, it originally called for Tagliarini, a thin flat noodle, but I tried it with my new favorite pasta, Bucatini. This is a prefect recipe that most people can make with available ingredients in a pinch (at least, I find I always have dried pasta, butter, parm and lemons). I quite enjoy having Giada on in the background but this is the first time I’ve made one of her dishes, and this Bucatini All’Amatriciana with Spicy Smoked Mozzarella Meatballs was spectacular! Bucatini is a hollow spaghetti, which I was happy to find was finally available at Fresh Direct, though it can also be purchased at any Italian market. While it may look like there are a lot of steps in this recipe, once they’re prepped, each element has a fifteen minute cooking or simmering time so it’s easy to get everything done at the same time in order to mix it into a sloppy, delicious plate. I didn’t have parchment paper for the meatballs – which have a cube of smoked mozzarella inside them!! – so they crumbled a bit, but with no sacrifice to the flavor. If this is any indication, I’ll be making more from Giada soon! A simple recipe with a small ingredient list is appealing for ease, but downright exciting when the list consists of favorite flavors that I’d never heard of together. 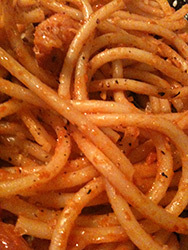 Such was the case with this Spaghetti with Crab, Chile, and Mint recipe that I found on Serious Eats (a blog that never steers me wrong). I love this recipe so much that when i had enough ingredients for a second batch, i counted down the hours to lunch the next day. It was hard not to be too gluttonous with this recipe of Pasta with Squash, Sausage and Goat Cheese. Another excellent dish from Use Real Butter, this is scrumptous and was absolutely perfect for the ungodly freezing temperatures we have been surprised with lately. 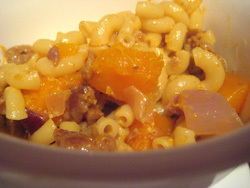 The original recipe calls for summer squash and rigatino but we adapted with butternut squash and macaroni. Call it the winterized version and love it. Mushrooms have been cultivated for thousands of years but modern cultivation commenced around the 16th century. 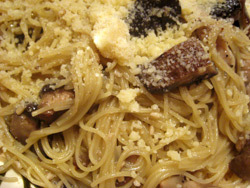 Epicurious offered the basis for my recipe of Wild Mushroom Pasta, but because I didn't use dried mushrooms, instead grabbing a bag of mixed varieties from Madura Farms at the farmer's market, I used chicken stock and a splash of wine instead of reserved mushroom water. Some of the best dishes are the simplest and only require a few great ingredients. Our friend Shaun just returned from Rome with an appetite for their amazing cuisine and was kind enough to share this dish, Bucatini all'amatriciana with us. 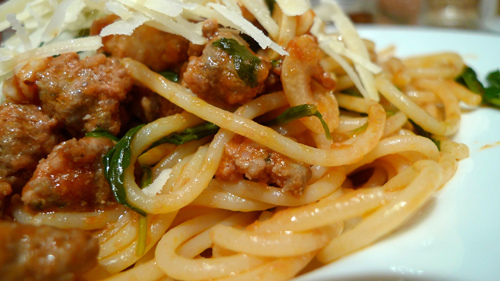 Bucatini is the key, a thicker hollow spaghetti that is filling, delicious and cooks quicker than most. 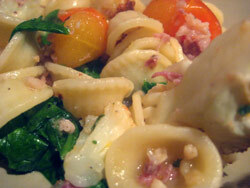 Also make sure to not substitute the guanciale, an unsmoked Italian bacon (Shaun found both at the Chelsea Market). This recipe came from this week's website of the week, Italialicious, where I plan to make many more excellent meals from. If I am at a loss for what to cook, I love to revisit the lovely little recipe site and former Brix Pick, Simply Recipes. Pasta with Roasted Cauliflower and Prosciutto sounded amazing and I rarely use cauliflower, which I like so much. Jim actually prepared this for me and says it pretty easy if you're not distracted and make sure your pasta is al dente. It's a great combination of flavors and a must for cauliflower lovers. 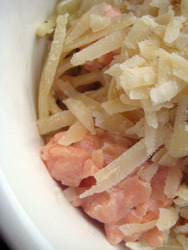 This quick recipe for Smoked Salmon Pasta reminds me of a trip my family took to Portland, Oregon taking my sister to college. There, in some bustling dimly lit seafood spot, I had an eye-opening culinary experience I still recall vividly and it was nice to revisit the taste. This recipe is also not too heavy.